Meshiya is a Japanese cafe style restaurant I have been dining at on and off for about seven years now. Conveniently located outside the QV centre in Melbourne, it has often been the place to grab a quick bite to eat before heading home from a day in town. Over the years there was been some small menu changes, an expansion of the drinks list, and the teppanyaki grill has been removed to provide more seating in an already cramped dining space. 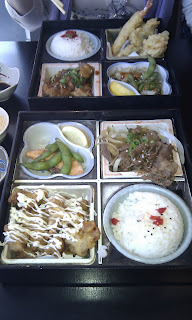 The food at Meshiya is generally good, and below is a quick run down of yesterdays lunch. My fiancee and I started off by sharing as serve of ika no karaage and a small plate of mixed sashimi. Ika no karaage is squid that has been lightly battered and deep fried, and this particluar serve had a light crunchy exterior, giving way to the tender squid. 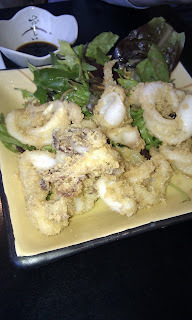 The dish was well drained and not oily. 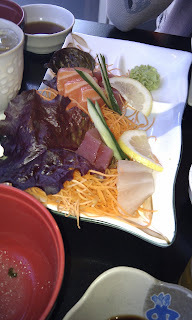 The sashimi was a mixture of tuna, salmon and snapper. The morsels were small however they were well chilled and didn't have that "fishy" smell that always raises the alarm bells when I'm about to eat raw seafood. For mains we each ordered from the selection of bento on offer. I enjoy bento as there is usually a range of small portions that leave you feeling satisfied, and not like you've over eaten. I find a cold beer always goes well with Japanese food, and I was pleased to find Yebisu was now available at Meshiya. Yebisu is a genuine import from Japan and often difficult to find in Melbourne, so you are usually left to decide if you would rather drink Asahi from Thailand or Sapporo from Canada. All in all the food at Meshiya is good value and I have never had a bad experience there. So if you are heading back to the QV carpark after a big day shopping and you are feeling a little peckish, I suggest you give Meshiya a try.